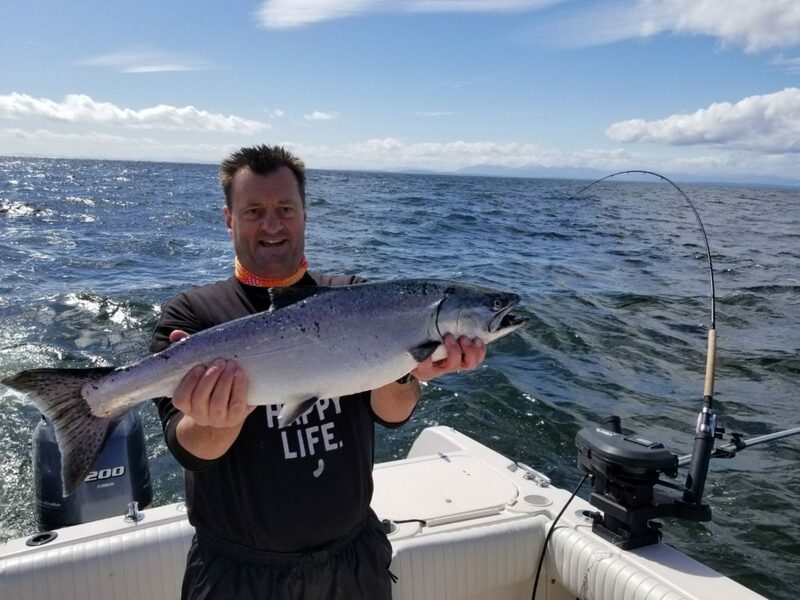 Captain Eddie’s guest with a nice one from a local trip this week. It has been a great week of fishing, but we can’t say the same about the weather. This past week we saw our fair share of SE winds and rain. Looking to the weekend and next week it looks like we will see a break in the rain and even some NW winds and a few days of light variable winds early in the week. 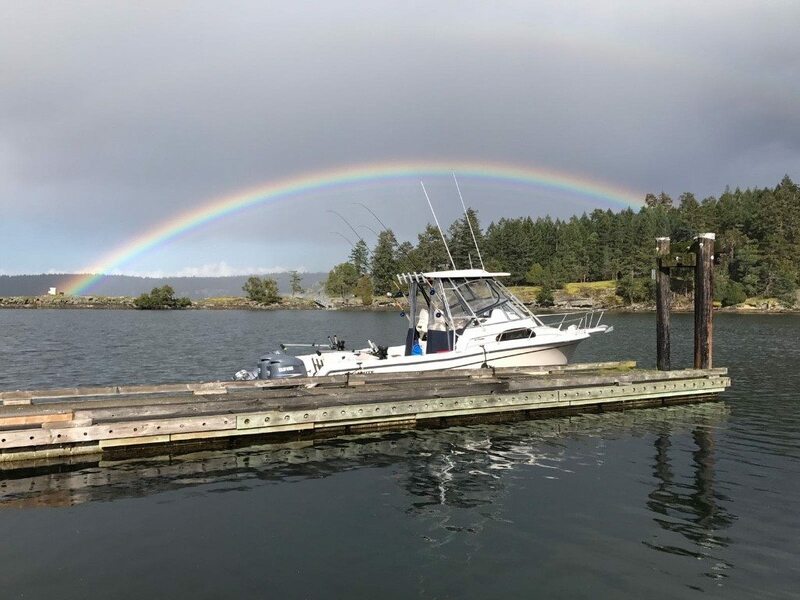 A Gulf Islands Grady Rainbow. On the fishing front, there is a lot going on. The best action locally has been around the QA Marker and out on the Hump. When the winds were strong and we couldn’t fish there effectively we retreated to the Bell Buoy and caught some nice fish there as well. If the sea conditions allow it though, we definitely recommend going out to the QA and Hump, as there is decidedly more fish further offshore. Best depths have been 70-145 on the riggers. Top producing gear has been flasher and spoon setups. BC, STS, Madi, Green Onion Glow, Salty Dawg, and the new Phantom Flashers in a chartreuse blade have all been producing well. For spoons 3.5 to 4.0 spoons in Irish Cream, Outfitter, Homeland, Kitchen Sink, and Herring Aide have been productive. There have been some fish caught on bait and hootchies too, but spoons have been the way to go for us. There are a lot of small fish, so you will be pretty active on the gear and spoons are a great choice to get the small fish off the line and get the gear back in the water as soon as possible. 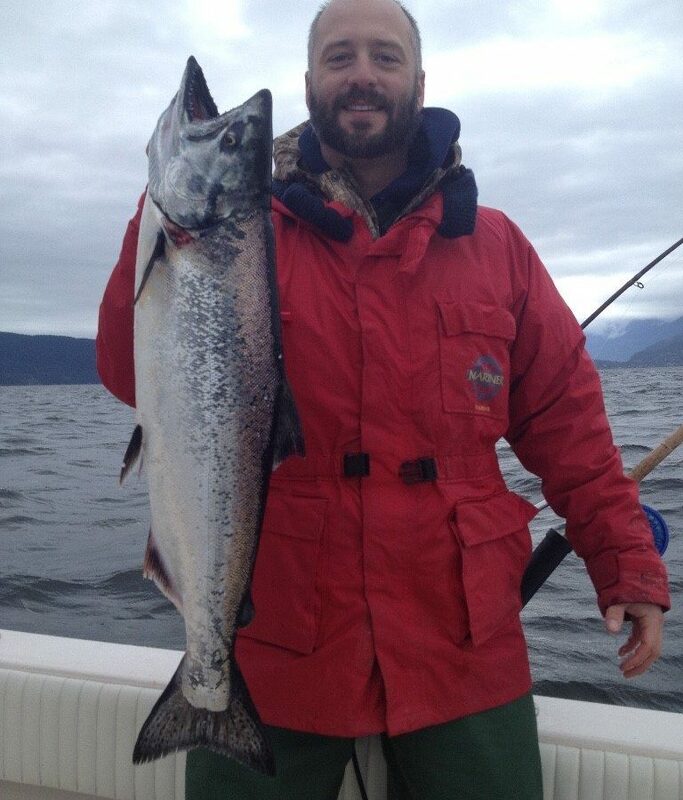 Guide + bookings Manager Lars guests enjoyed double headers and a good number of chinook on their trip this week. Just to keep it interesting, there are some fish in Howe Sound as well. We have heard of a few fish at Hole in the Wall and other spots further up the Sound. You may remember that this time last year, almost to the day, the fishing at Thrasher was absolutely red hot, some of the best we have seen in years. Well there are some fish over there already, it is not as red hot as last years start. The pressure so far has been light to non-existent, so if the winds are light you might want to head over and look for some fish. I think they are there, just nobody seems to be heading over or they haven’t had the winds to allow it. 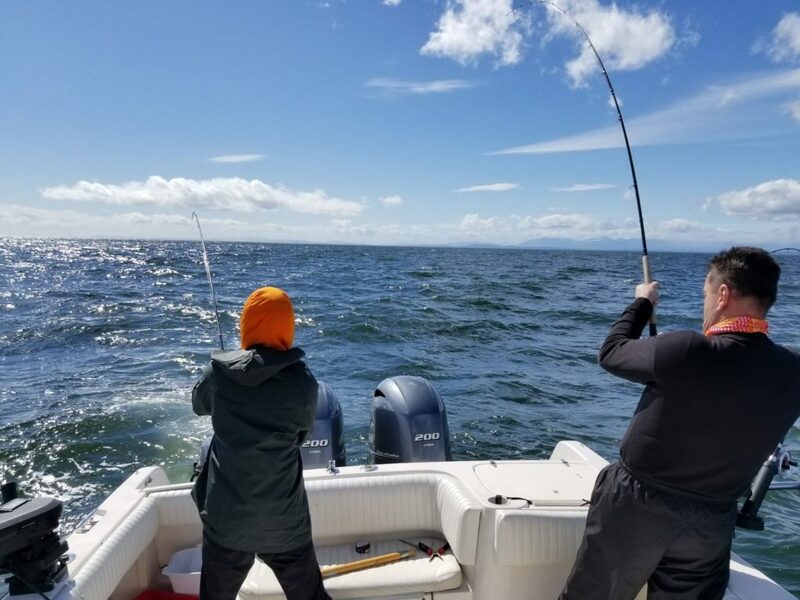 There haven’t been too many people off the QA or the Hump either, as usual, most people don’t seem to have their boats ready for this chinook fishing that always gets going around the second week of April. This will all change as we get into May and the weather warms up and the reports have been good for 3 weeks. So if you can go now I would recommend it, as there are lots of fish around and virtually no pressure. Crabbing has been steady, worth dropping traps but not red hot by our standards. Prawning has been good though, so if you are into prawns it is definitely worth setting out the gear.